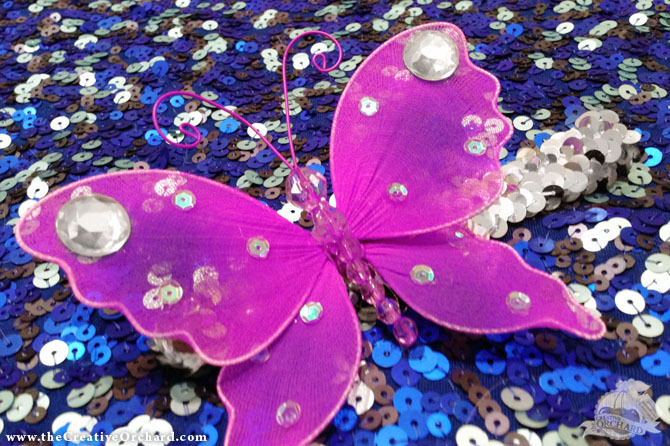 Once upon a time, my husband and I were on vacation and visited "The Butterfly Place" in Missouri. 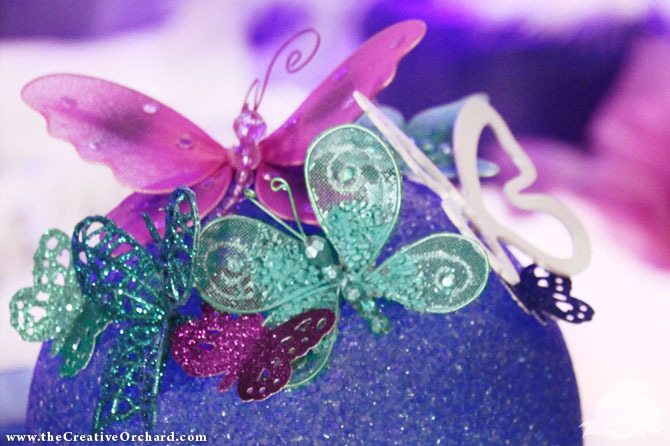 Basically it was a huge walk-in green house open to the public with thousands of BUTTERFLIES that fluttered all over the place and some even landed right on me. 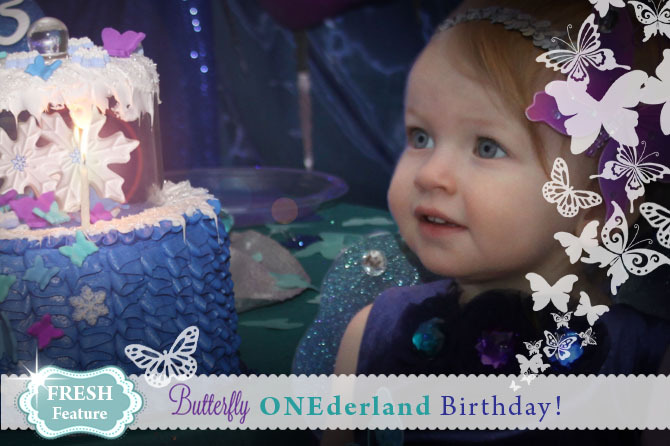 It was a very BEAUTIFUL and MAGICAL moment and I wanted to recreate that experience for Haley on her first birthday. 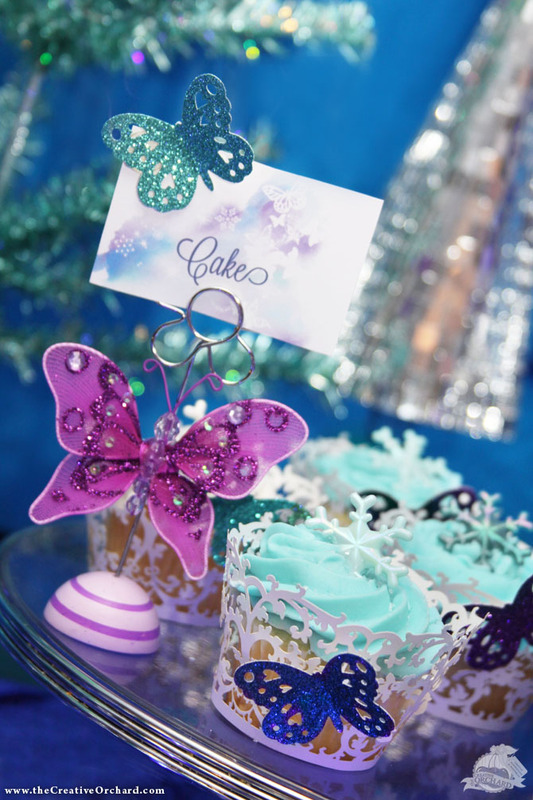 What really set the tone for the guests, were the handcrafted invitations with custom watercolor illustrations, sparkly snow swirls and three-dimensional glitter butterflies that looked as if they were going to flutter right off the paper. 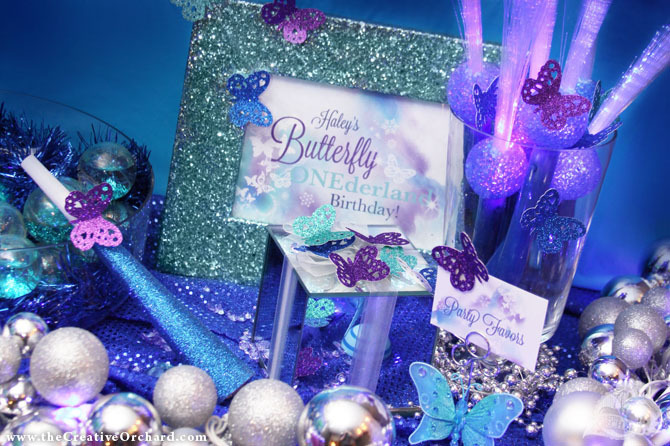 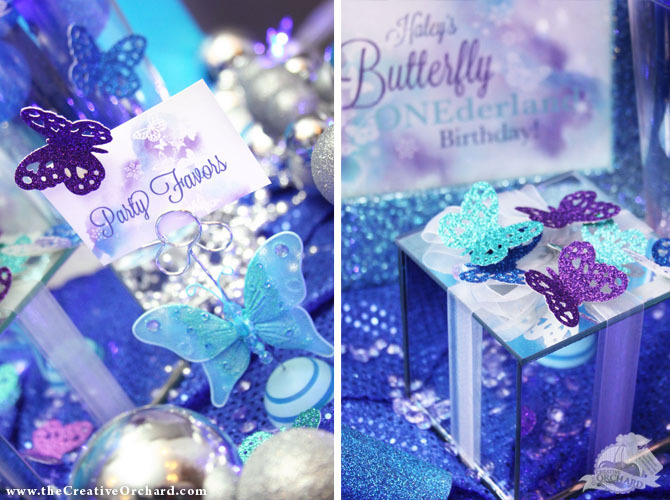 Matching printable cards with butterfly clip stands were used to label all the designated areas and a welcome sign was displayed inside an aqua glitter photo frame. 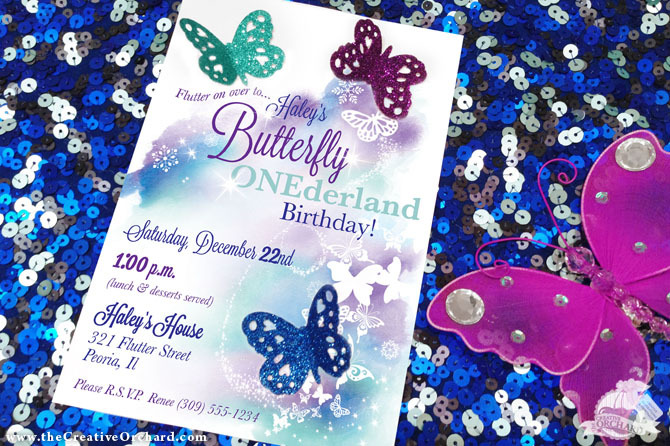 "Butterfly" printables will SOON be available in the Creative Orchard shop! 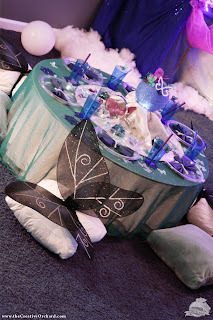 For something unexpected, I thought it would be unique for the party decor to mimic a snowy winter night with lots of butterflies. 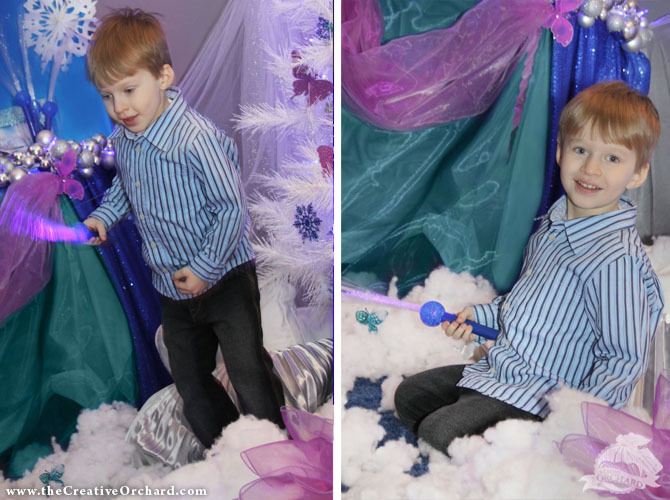 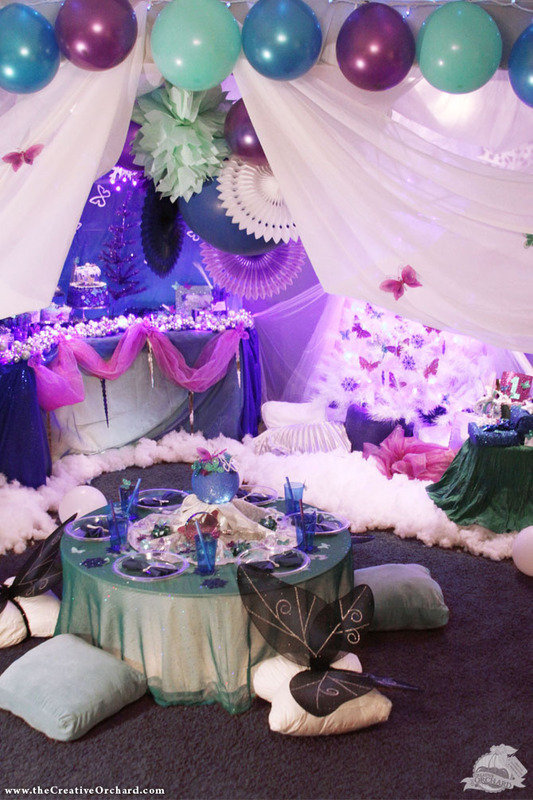 The color scheme included winter white, dark royal blue, cool aqua and two shades of deep purple. 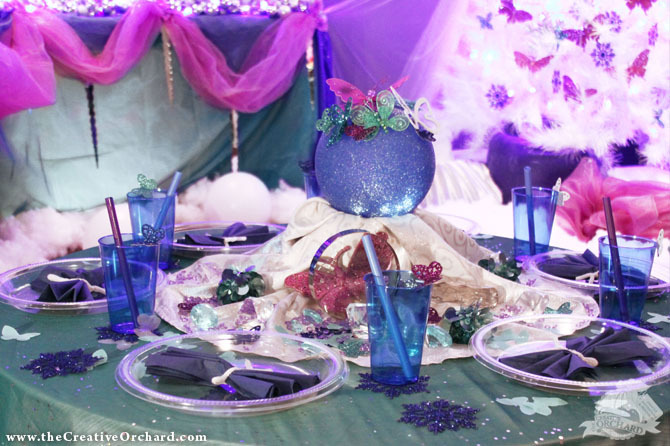 GLITTER, SEQUINS and SPARKLY lights, all set the perfect glamorous mood. 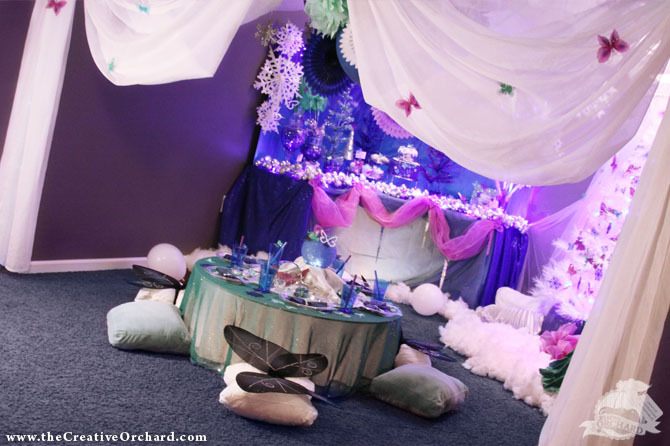 I have never really thought much about the lighting for my past parties but I felt it was an extremely important element to achieve the look of a starry night and it was well worth the extra planning time because it took the decor to a whole nother level! 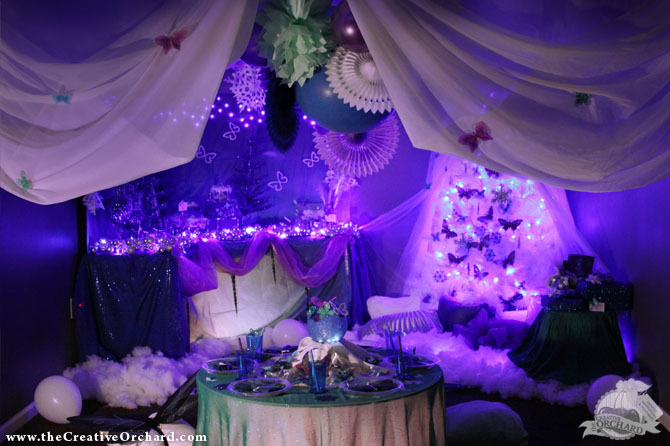 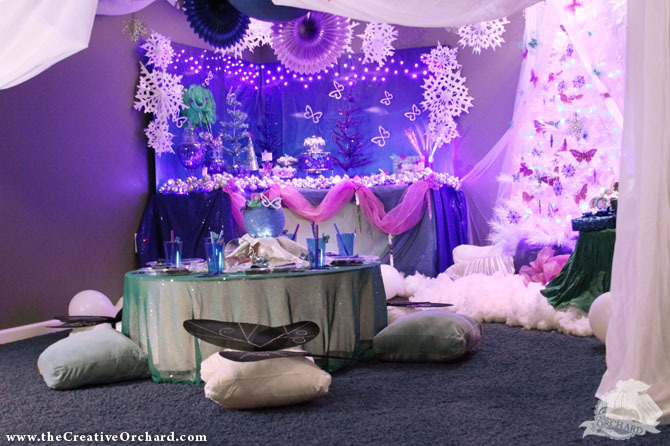 Everything I could think of had lights - dessert table backdrop, tree, table top, ceiling, under tables, throughout snow, inside globe and also flood lights casted over the walls to change the color of the room. 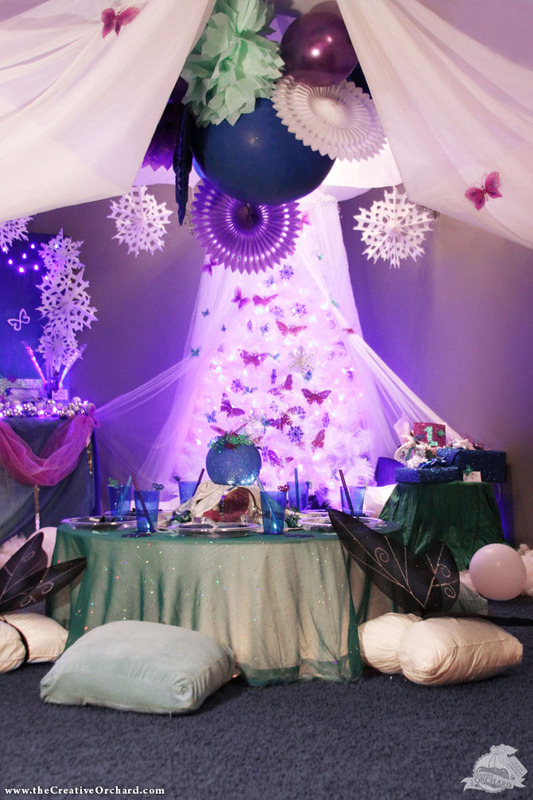 The space I purposely chose was small with three walls so that I could drape the entire ceiling and entry with long white sheers to help create a more intimate enclosed feeling. 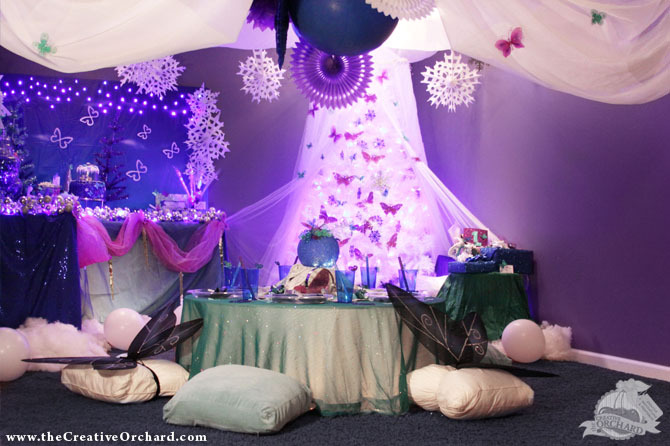 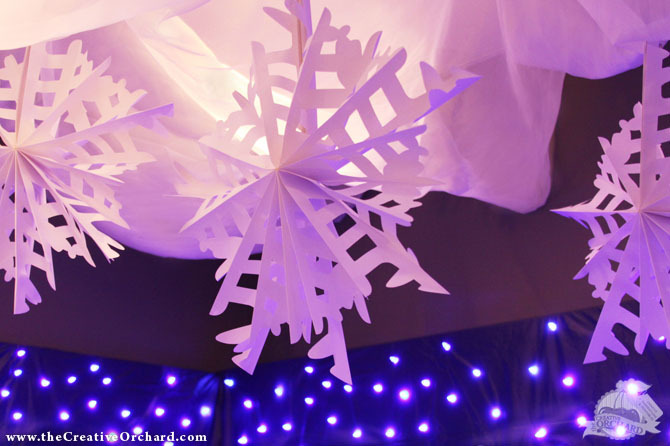 Polyfill was tossed on the floor as fake snow and a large bed of the "snow" went in front of the canopy covered butterfly tree to add more comfort to the lounge area. 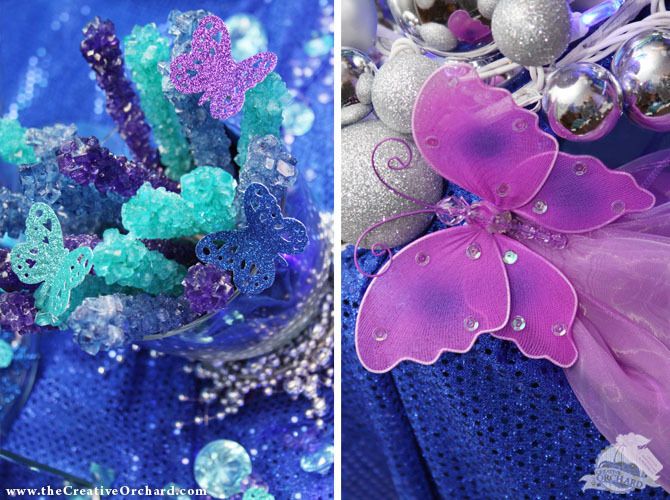 The BIRTHDAY girl, Haley, wore a GLAMOROUS dark blue BUTTERFLY tulle dress with three layers of multi-colored tulle ruffles across the bottom, glitter ribbon sash tied around the waist, large rhinestones set inside tulle rosettes around the collar and whimsical butterflies flew down the front's side. 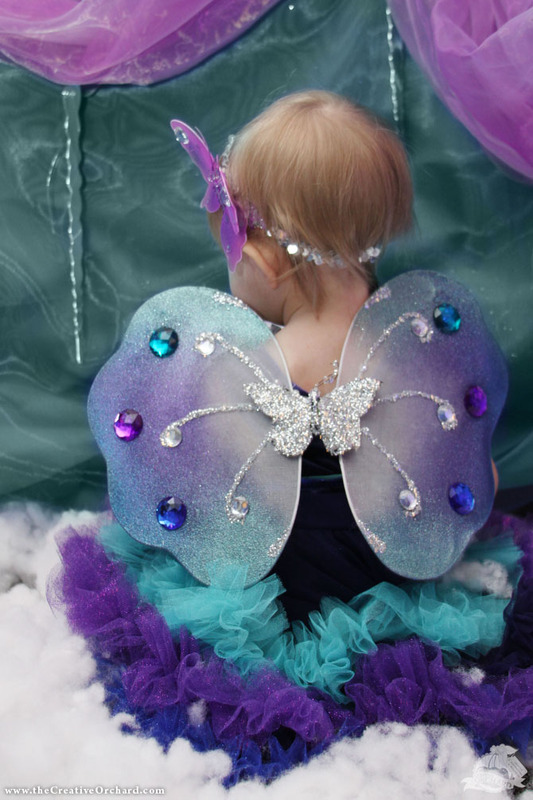 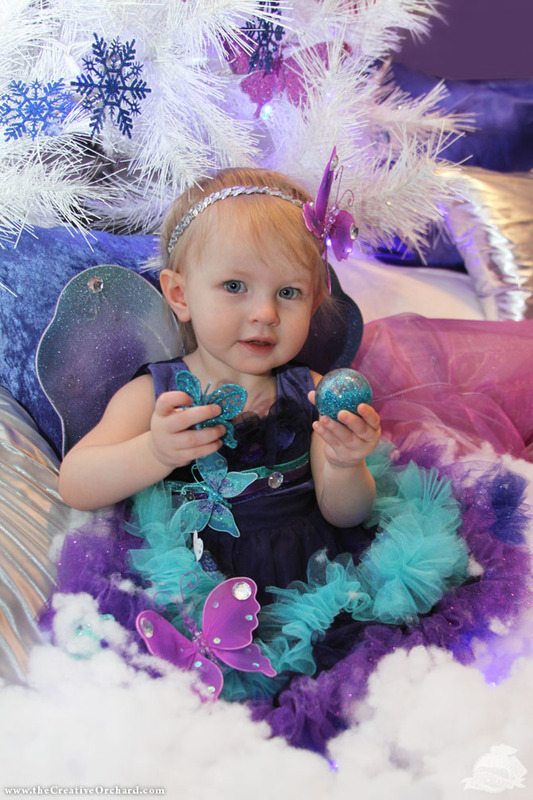 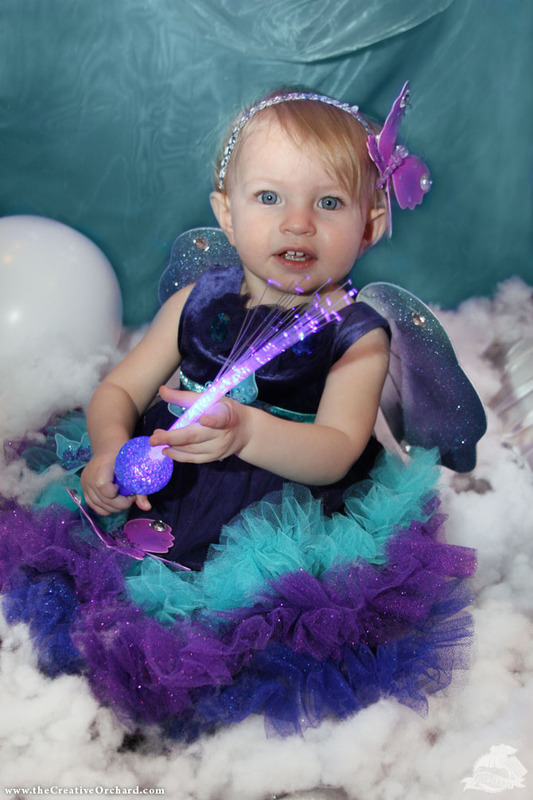 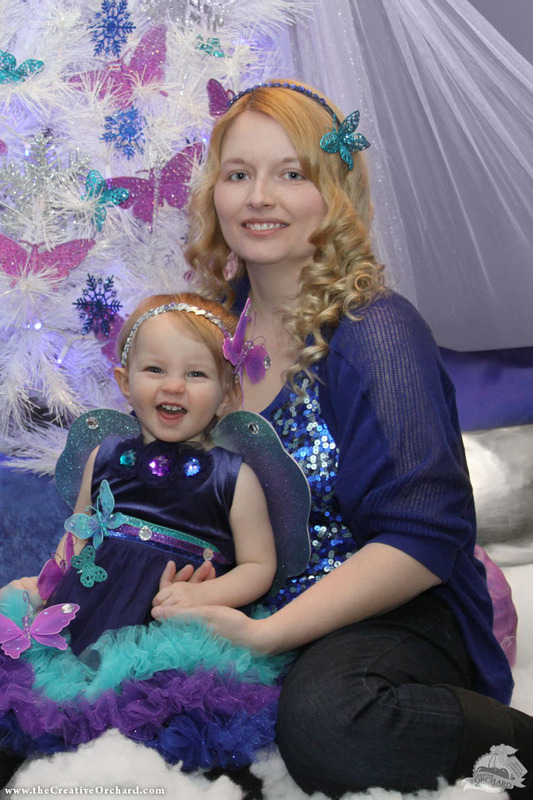 Large glittery BUTTERFLY wings were pinned to the back and a sequin BUTTERFLY headband finish off her look. 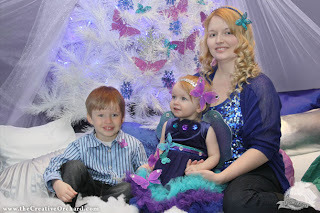 I was dressed up in a royal blue sequined tank top and cardigan, plus a blue rhinestone BUTTERFLY headband. 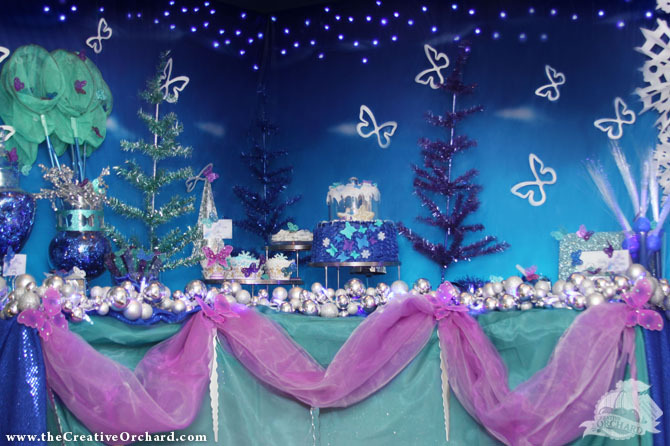 My favorite DIY project was the dessert table's backdrop which was a STARRY night sky made with foam board, covered in a dark blue plastic table cloth then, blue xmas lights were poked through the backside. It looked way better than expected and it was easy to do thanks to my hubby's help! 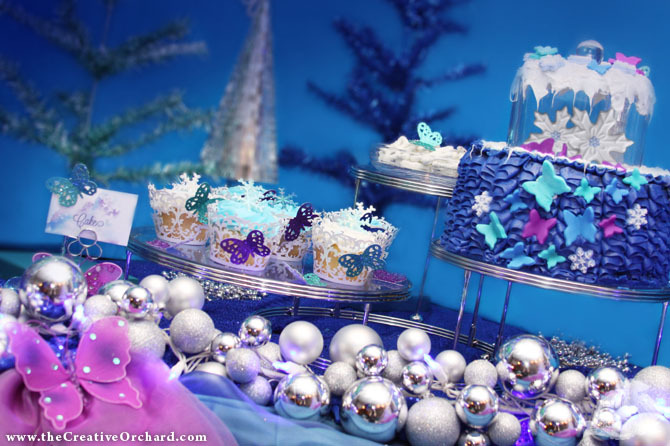 Sitting on a three-tiered stand were the birthday cake, snowflake ring cupcakes and chocolate covered snowflake shaped pretzels. 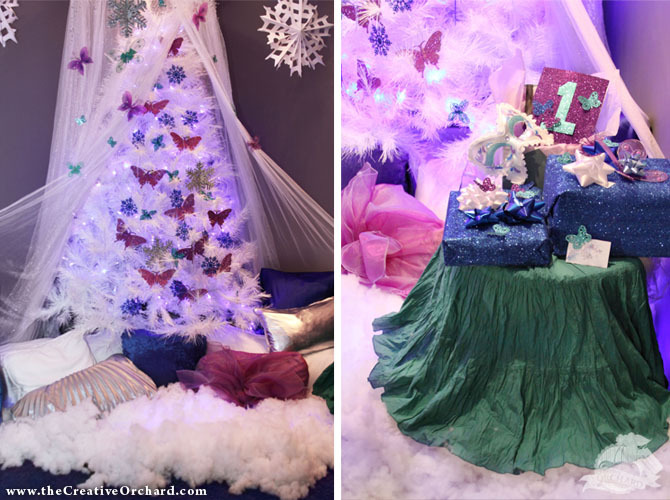 No surprise to me that the birthday cake was the most time consuming task for the party. 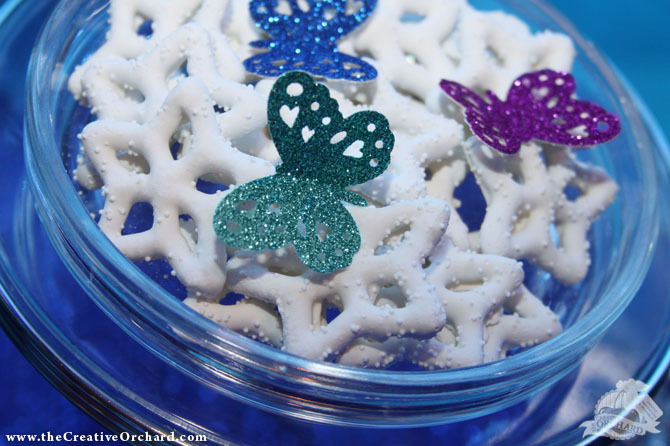 While designing the cake's concept, I was torn between butterflies in an apothecary jar or inside a snow globe, so the end result of the cake topper was a combination of the two ideas. 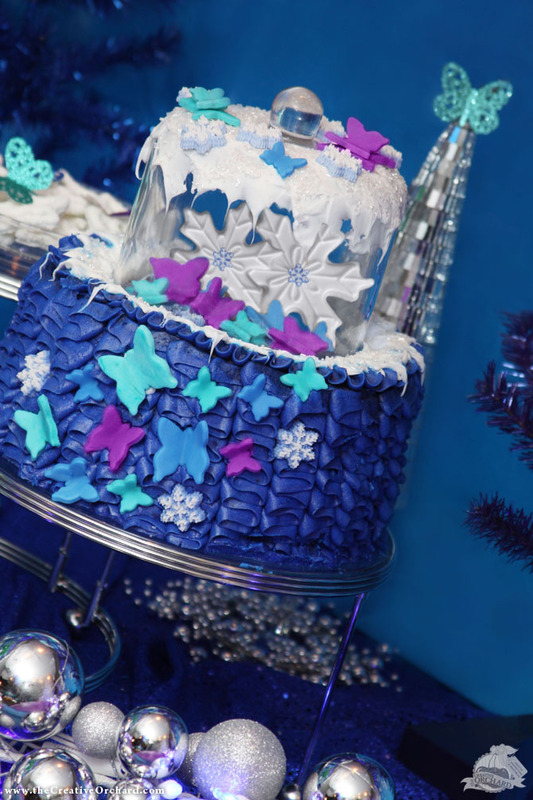 The base of the cake was surrounded in layers and layers of royal blue ruffled frosting, fondant butterflies were scattered across the front and on top sat two snowflake cookies covered in fondant butterflies nestled inside a snow frosted glass dome. 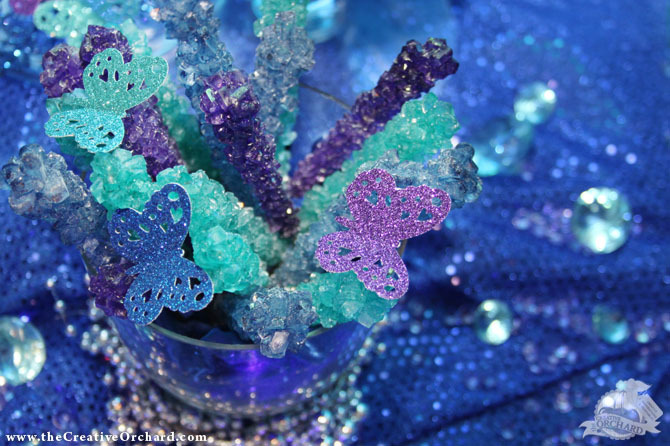 Candy section had an assortment of apothecary jars filled with rock candy, butterfly candy skewers and butterfly kisses. 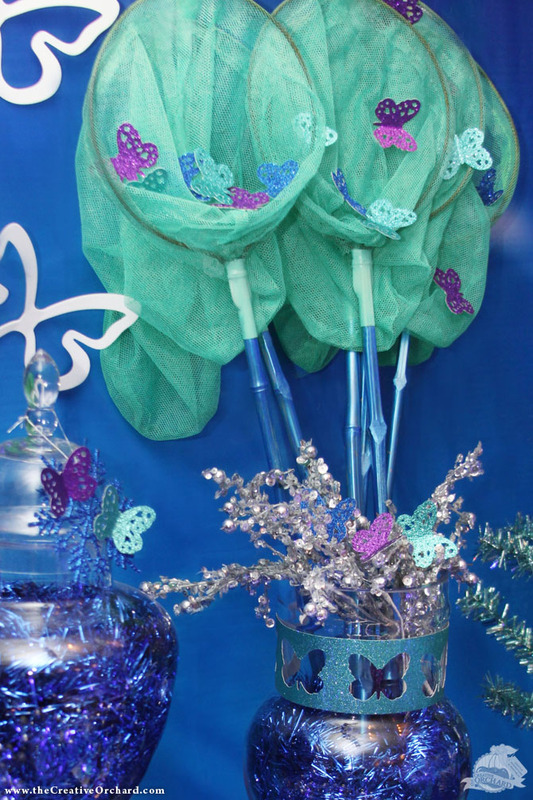 BUTTERFLY nets were available to hold their candy selections. 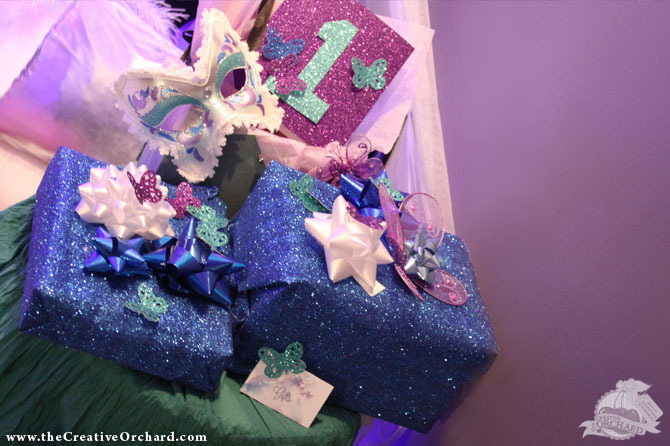 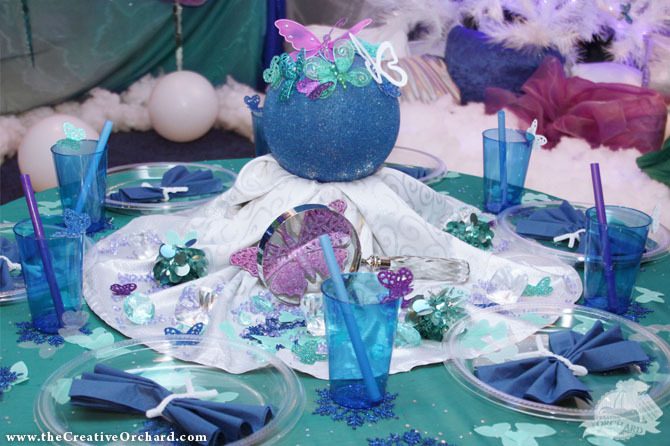 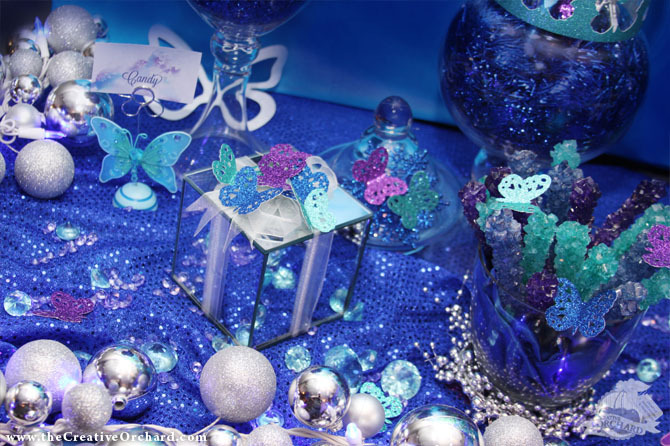 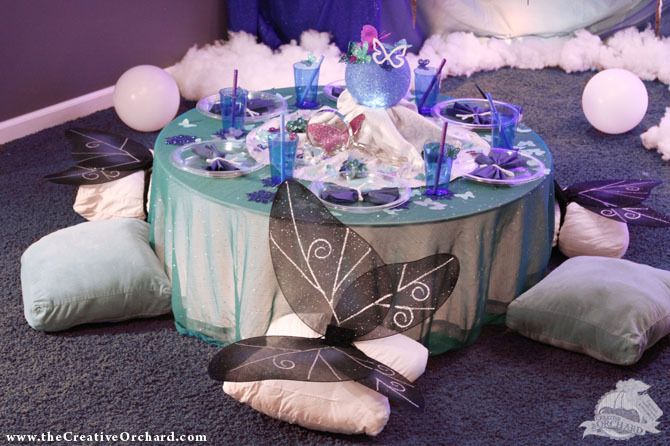 I went all out with the party favor "buffet" which included blue cellophane baggies to be filled with glitter bouncy balls, glow stick jewelry, bubble tubes, light-up bling rings, gem confetti and fiber optic wands embellished with a paper glitter BUTTERFLY. 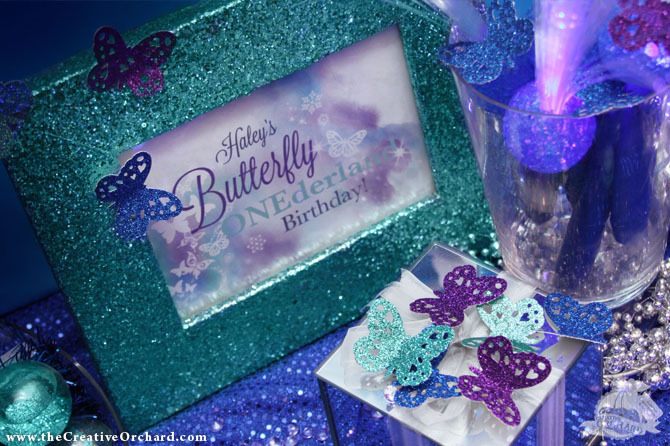 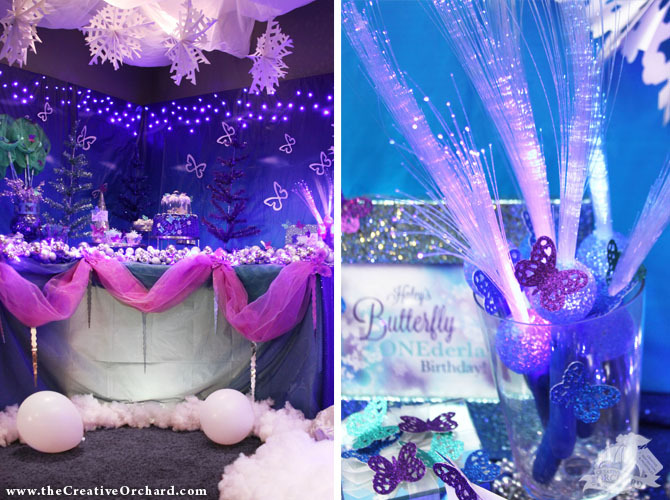 Thank you all for FLUTTERING on over to the Creative Orchard blog to view "Haley's Butterfly ONEderland!" 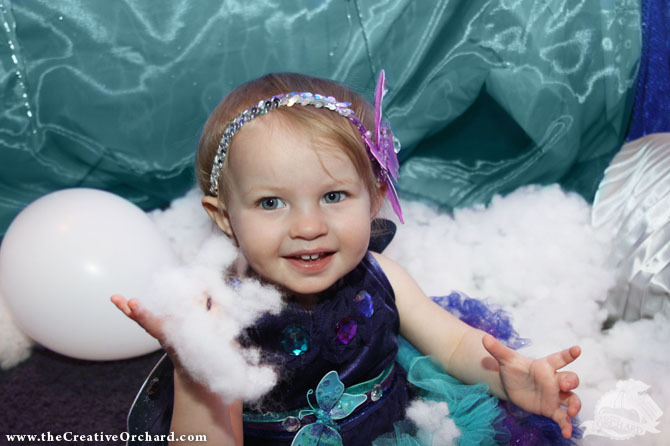 Hope you had a HAPPY 1st BIRTHDAY HALEY!!! 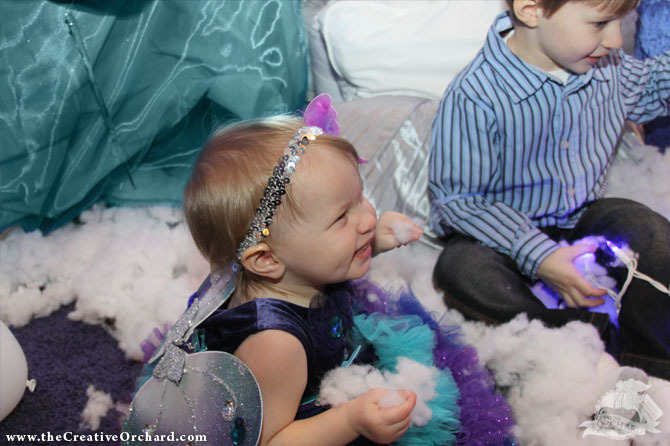 Haley & Allen dancing to the HAPPY BIRTHDAY song by The Ting Tings!!! 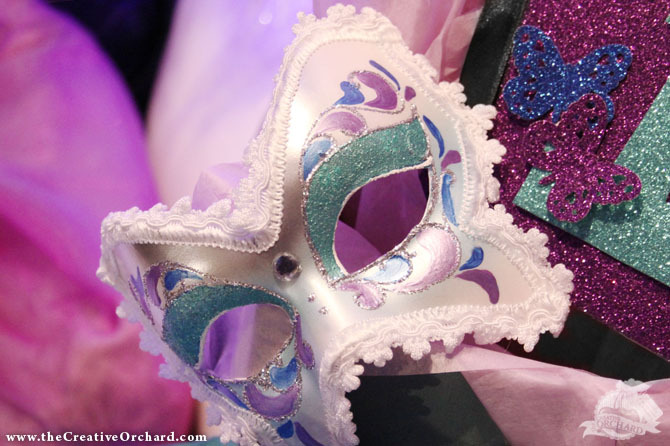 PHOTOGRAPHY POLICY: I am giving you permission to share up to 3 photos online from this specific blog post ONLY, but PLEASE give CREDIT to the Creative Orchard and provide a LINK back to www.theCreativeOrchard.com. 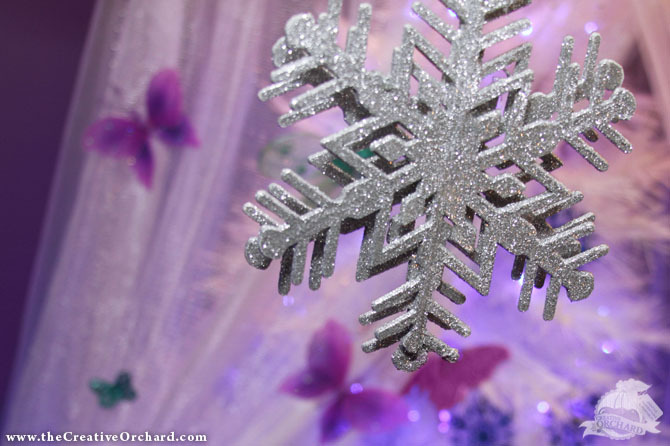 Do NOT REMOVE photo watermark. For personal use ONLY. 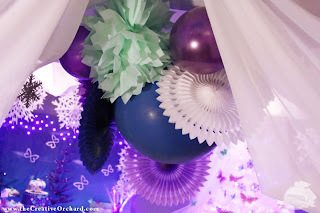 Pinners from Pinterest are welcome to pin my photos.